Barbara Corcoran: One Shark You’d Love Swimming With! Most of us are familiar with Barbara Corcoran as a real estate mogul and star of ABC’s Shark Tank. Barbara made her fortune at first leasing and then selling NYC real estate when she owned The Corcoran Group. 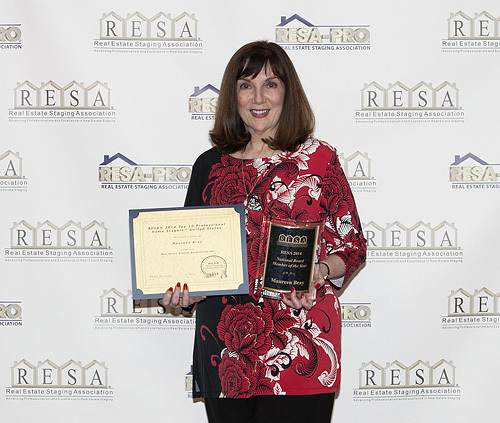 I had the pleasure of meeting Barbara recently at the Real Estate Staging Association‘s annual convention in Las Vegas; Barbara was our keynote speaker, and her story was so inspirational! You have the Right to be there! Never think that you don’t or can’t fit in with a particular client, or committee, or meeting. You can! FUN is good for business! Remember to have as much fun as you can … people will love working with you! There’s really no “balancing” your work life and personal life. Do the best you can, and remember that your family is #1. Barbara shared a touching story that her proudest moment in life happened when her son was born — not when she sold her real estate company for many millions. After Barbara’s talk, I was thrilled to be able to chat with her in person! 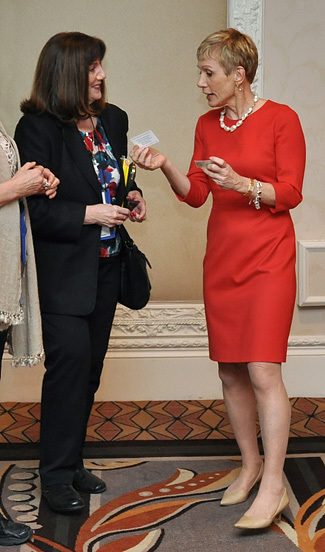 Here she’s complimenting my business card. Barbara is a strong proponent of home staging as a marketing tool and believes that it’s becoming the norm in today’s market, rather than the exception.